think our versatility had a good part to do with our longevity," said Cory Wells. "Not only did Three Dog Night have three lead singers, but also three distinctive styles. Chuck Negron was our ballady Johnny Mathis type, I was hard R&B, and Danny Hutton was a sort of middle-of-the-road kind of singer. Put together, we made our own kind of California sound." After an impressive debut in 1969, Three Dog Night emerged as one of the most successful rock groups of the early seventies. They scored eighteen Top 20 hits in a row -- twenty-one hits in total -- before their farewell concert at L.A.'s Greek Theater in July 1976. "We never tried to push our product on the public," Cory said. "Our whole idea was to record every song, taking the approach that it was the single. We'd record 'em, put 'em in an album, and then release the album. The public knew what they wanted, what they liked; why should we try to outguess them? Whatever tracks got the best response we'd then issue as 45s." In 1971, four of their tunes became singles, and all of them made the national Top 10: "Joy to the World," "Liar," "An Old Fashioned Love Song," and "Never Been to Spain." Cory recalled the biggest of that group, the best-selling single the band -- or ABC Records -- ever produced. "He had mentioned before that he was writing a ninety-minute animated children's TV show called The Happy Song. It was the story of a bunch of children in fantasy land and their adventures and misadventures. He wrote it so it could be played at any time of the year -- Christmas, Halloween, New Year's -- any holiday. "Hoyt played it for us right there on his guitar, which was not the usual way we auditioned material. It's hard to get the idea of a tune that way because you get into the performance instead of the song. But we knew Hoyt personally; he'd traveled with us many times as an opening act. He's a very close friend of the group. "As he stood there, playing the song for us, I remember not liking it that well. There are certain songs where you can say 'that's a smash' but you wouldn't want to sing 'em. I knew it was gonna be a hit, but 'Joy' was too light for my taste. I tend to lean toward heavier sorts of music. The other guys, though, thought it was great, and I remember recording the song and Chuck singing it. "We were out working maybe 350 days a year then, moving faster than the music was behind us. We were just zooming along, and everything was a collage of Holiday Inns, airports, and backs of limos. I couldn't even tell you where I was when it reached number one, it sold so many copies so fast." Hoyt Axton added a footnote. "Actually, I didn't expect 'Joy to the World' to be a hit at all," he said. 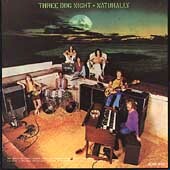 "After Three Dog Night cut it, they played the tape for me and I thought it was terrible. Then that son-of-a-gun was on top of the charts for six weeks across the board. I looked in Billboard magazine, and saw that in Singapore and Malaysia, the song was number one. That made me feel great, because I could imagine all those little kids with holes in their shirts and no shoes rockin' around singing 'Jeremiah was a bullfrog.' I mean, that cracked me up."